Web Content Management: Ensure proactive updates to web content for optimal SEO. Contract Management: Enable contract management knowledge workers to get ahead of contract renewals with scheduled email notifications at 90, 60, and 30 days. Policy and Procedure Management: Trigger a workflow process to alert users of content requiring review annually to ensure company policies and procedures are up to date. Sales Enablement: Provide key stakeholders with better visibility into new or updated sales or marketing material. Today, Subscription Notifier is sold as part of the Admin Suite and included in our controlled document management solution – ControlCenter. 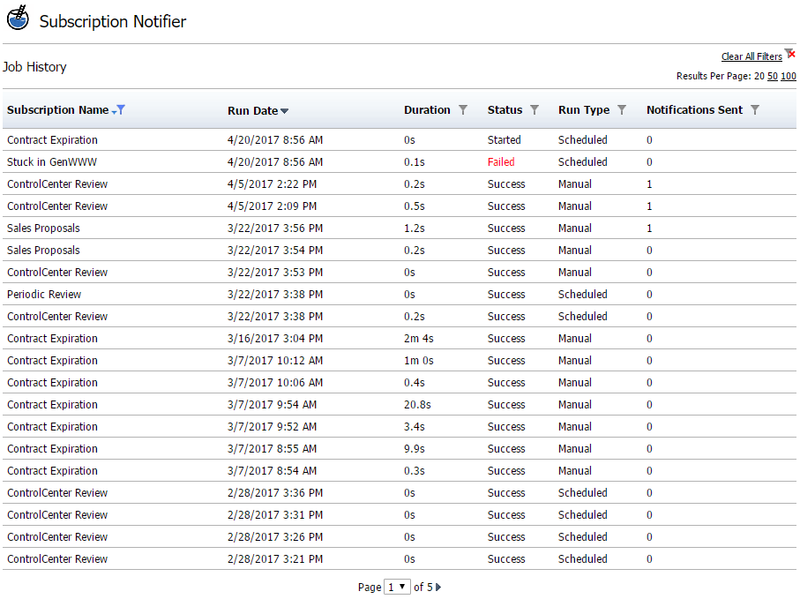 Due to its value-add content management capabilities, Subscription Notifier has become one of our most popular products. We continue to make enhancements to the product, and just last month, we released version 5.0, which brings some customer-requested capabilities. Before I provide an overview of what’s new in version 5.0, I want to start with a brief introduction on what Subscription Notifier actually does. Subscription Notifier is a query-based email notification and scheduled job utility that enables proactive content management in WebCenter Content. With an easy-to-understand subscription builder, you can quickly create subscriptions based on any business rule in your content server – not just expiration. You can schedule the subscription to run on an hourly, daily, weekly, monthly, or yearly basis, or let it run without a schedule to notify users as soon as possible. It also enables you to specify users and/or aliases to be notified of content that matches the subscription query, either directly by username or by using a metadata field, email address, or Idocscript. Other options are available to further customize the subscription, but the core is that simple – specify a schedule, include the users to notify, build the query, and you’re done! As I highlighted in the policy and procedure management use case above, subscriptions can be set up as periodic reviews, which will put content items into the specified user’s “Documents Under Review” queue as the item’s expiration date (or any other specified date) approaches. Content remains in the queue until one of three actions are taken: “No Change Necessary”, allowing the user to update the review date without updating the content item; “Check Out and Revise”, updating the content item and its review date; or “Approve Expiration”, which lets the content item become expired. The review queue appears in both the core WebCenter UI and ControlCenter. Periodic reviews are one of the most useful features of Subscription Notifier, enabling companies to stay on top of expiring content and ensure that content is always kept up to date. Beyond notifications and reviews, Subscription Notifier can also empower data synchronization through Pre-query Actions and Side Effects. These are extra effects that are triggered either once before the query executes (Pre-query Actions) or once for every content item that matches the subscription query (Side Effects). Custom Pre-query Actions and Side Effects can be created, and Subscription Notifier comes packaged with some useful Side Effects. These include actions to update metadata, delete old revisions, check-out and check-in, update an external database, and resubmit a content item to Inbound Refinery for conversion. Subscriptions don’t need to send emails – you can set up subscriptions to only trigger these actions. By specifying a role in the component configuration, non-administrators can now create subscriptions in Subscription Notifier. Users with restricted access can create subscriptions in a restricted view, which both simplifies the view for the non-tech-savvy and ensures security so that end-users do not have access to more than they should. Administrators can still manage all subscriptions, but users with restricted access can only manage subscriptions they have created themselves. This has been a highly-requested feature, so we’re excited to finally bring the requests to fruition! Taking a feature from ControlCenter, user and alias fields on the subscription creation page will now offer type-ahead suggestions based on both usernames and full names. No longer do you need to worry about the exact spelling of usernames – these validated fields will do the remembering for you! In addition to greatly improving the look and feel of the subscription creation page, these newly improved fields also enhance performance by cutting out the load time of populating option lists. Administrators can view an audit history of subscription job executions, allowing them to view when subscriptions are evaluated. The table can be sorted and filtered to allow for detailed auditing of Subscription Notifier. 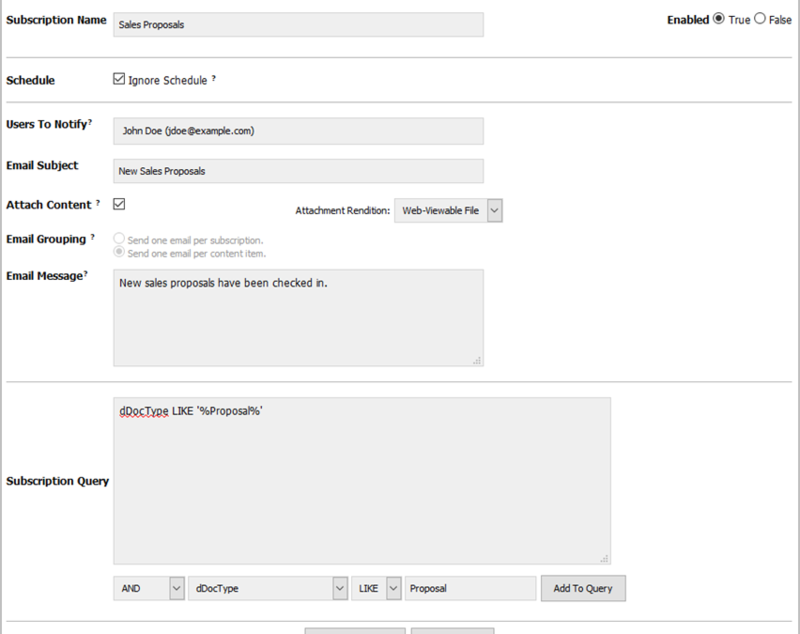 By inspecting an individual job run, you can see which content items matched the query and who was notified. If a job run failed, you can easily view the error message without delving into the content server logs. Sometimes Inbound Refinery hits a snag, and content items will fail conversion for no apparent reason. This new Side Effect will allow you to resubmit content items to Inbound Refinery to attempt conversion again. You can specify the maximum number of times to attempt the re-conversion, and the queue of items being added to the conversion queue is throttled, so you don’t need to worry about clogging up Inbound Refinery with conversion requests. Subscription Notifier has allowed you to specify whether to enforce content security when sending emails, making sure users only are notified on content they have permissions to read or letting users be notified of everything. Previously, this was a component configuration setting, but now this setting can be changed on each subscription individually. 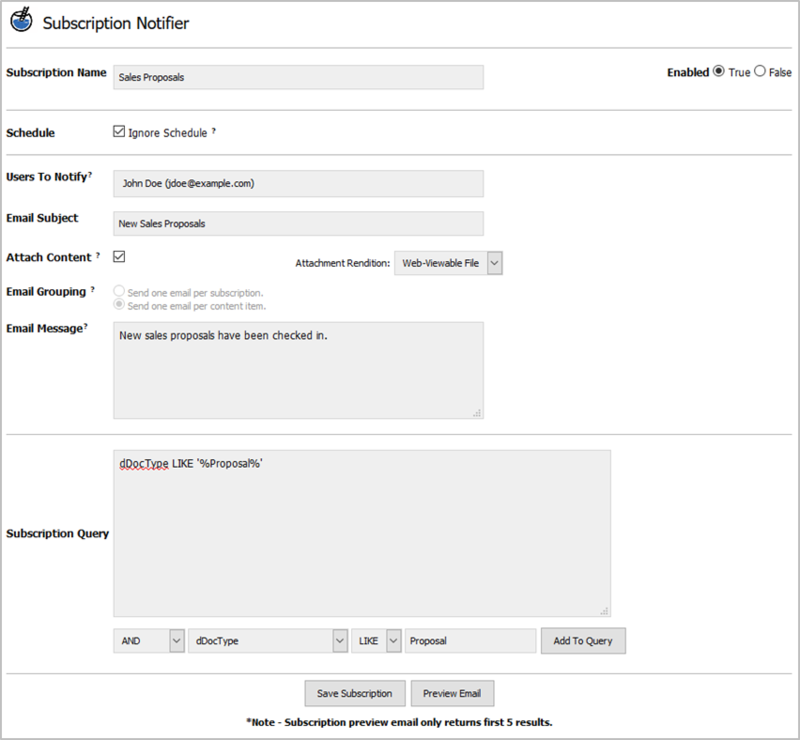 That about wraps up this spotlight on Subscription Notifier. I hope I was able to share how a simple yet powerful notification and subscription solution for Oracle WebCenter supports multiple use cases for proactive content management. At its core, Subscription Notifier helps organizations keep their content up-to-date while providing visibility into the overall content creation process. Its powerful side-effects capabilities can be used to trigger workflows, update metadata, delete old revisions and more – providing more proactive methods for users to best manage high-value content in an organization. If you’re interested in purchasing Subscription Notifier or upgrading your existing copy, please contact us for more info.